So, I gave in and picked up a Chromebook Pixel. I admit, I’m seduced by the high-resolution 2560×1700 screen. Nom nom nom so many tiny pixels! The machine also correctly handles mixed-resolution situations when you plug in an external monitor. (The plug is mini-DVI, conveniently compatible with your existing MacBook VGA, DVI, or HDMI adapters. Yay!) Hook up a regular 1080p monitor and drag a browser window over — it’ll automatically switch to low-density and everything appears the correct size. Move the window back to the main screen, and it pops back into beautiful high-resolution. The main limitation is that windows can’t span screens; except during the move operation itself they display only on one monitor or the other. 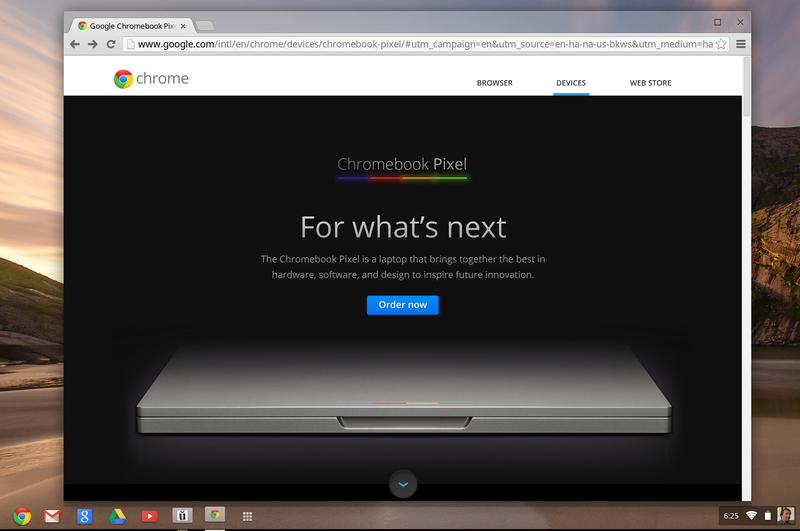 But of course you’re all wondering about Chrome OS and its suitability for a medium-high-end laptop. Is it good or bad? Hard to say so far, I’m still exploring it… but be aware the machine isn’t limited to Chrome: it’s easy to unlock to developer mode and either mess with the underlying Linux system or install a stock OS distribution like Ubuntu. Just to prove it to myself, I went ahead and followed the directions on switching to developer mode, enabling USB and legacy booting, and was able to boot an Ubuntu installer stick into the GUI. (I was stuck for a while unable to boot, but it turned out to be because I had an incomplete .iso download. Whoops!) Unfortunately the trackpad isn’t supported in the stock distro yet; some people have been working on drivers, but I might wait a bit for it to be better integrated. Ubuntu’s Unity desktop also isn’t quite “retina-ready”, and needs some more loving for high-density screens. In the meantime, I’m trying out Chrome OS as she was meant to be spoken. As a fan of Firefox OS, the idea of a browser-centric OS already appeals to me (though they are very differently implemented under the hood)… but I also know that there are limitations. As for getting “real work” done… thanks to Apple’s limitations I can’t do iOS development on anything but an actual Mac OS X machine, so I won’t be using it for my current main project. But it can serve well for secondary tasks: poking the wikis, email, calendering, chat, Google Docs and Hangouts, notes in Etherpad, etc. If I can rig up an SSH key, I should be able to ssh into my own or work servers in the terminal to do some maintenance there. In theory, I can do web development through an in-browser IDE like Cloud9 — I’ll try it out on MediaWiki and see what I can report. crouton will let you boot into a chrooted ubuntu environment with the working stock touchpad and wifi drivers.